Build an amazing tower, sprawling playground, or colorful house with the interlocking bricks, then add on gears and equipment to complete the structure. Place the motorized gear block in the perfect position, and arrange the fun animal characters to watch them play. Once you flip the switch, the entire creation will come to life as gears spin, swings sways, see saws teeter, and the merry-go-round rotates over and over again. Your kids will love watching the little monkeys enjoy themselves on the structure they built, but they will have even more fun taking it apart to build something better. 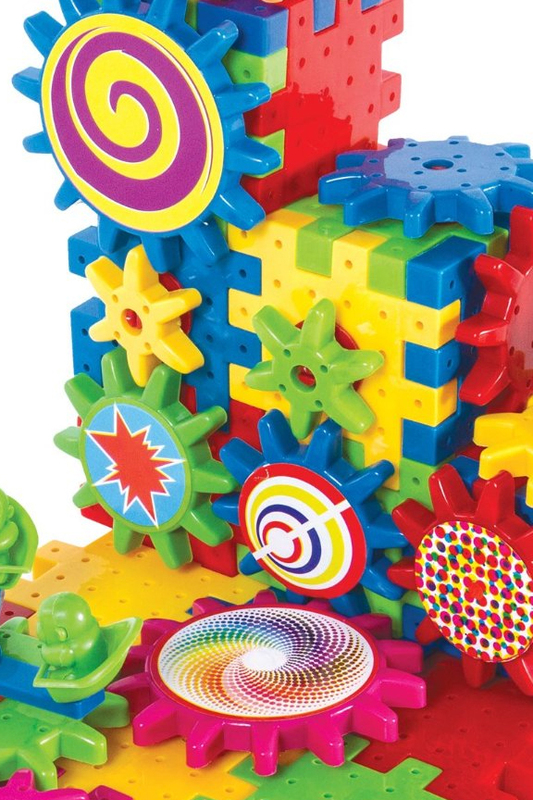 This 81 piece set is packed with educational value, and bursting with creative fun. Children will laugh and smile as they construct increasingly complex contraptions, and they won't even realize that they're learning at the same time. Important skills like hand eye coordination, spacial relationships, problem solving and basic engineering will be strengthened as they play, and the fun colors, motorized action, and endless possibilities will keep them coming back for more. Motorized. You can use the manual crank if you want, but the battery powered block with motorized gear will cause everything to move with a flip of a switch. Educational. 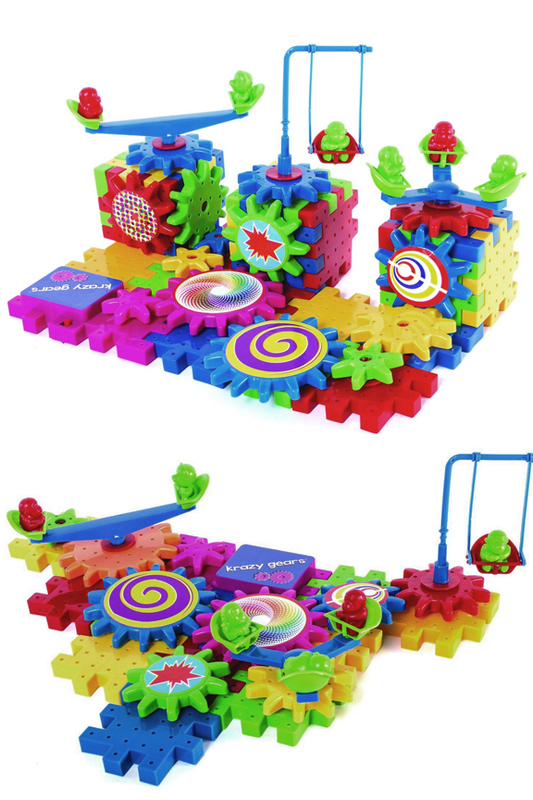 These interlocking blocks promote learning and skill building, so kids will have fun as they exercise their brains, improve coordination, and learn how to think critically by they design and re-design complex creations. Colorful. The bright colors give it a fun look and help to hold kids attention. With added stickers to decorate the gears, this set offers an enjoyable visual experience. Easy. The large blocks combine easily, and they're easy for small hands to maneuver. No Limits. With endless building possibilities children will continually discover new ways to arrange the pieces. 81 Pieces. A large enough set to offer a wide range of possibilities. All Ages. It does contain some small pieces, so it's best for children over three, but young and old alike will have fun with this set. Younger children will create simple interactions, and older kids will push the envelope to see what is possible. This set includes a total of 81 pieces, and it has a nice assortment of interlocking bricks, gears that rotate, playground equipment and characters to play. The brightly colored parts come in a variety of sizes and shapes, and they easily combine for a plethora of possibilities. Take a look at the picture below, and the list that follows to see exactly what is in the box. 1 Battery powered motor block. 1 manual crank and stickers for decoration. Don't settle for regular plastic bricks, or gear sets that restrict children by forcing them to build in a linear fashion. Give them an interactive play set that will hold their attention and improve their thinking skills. 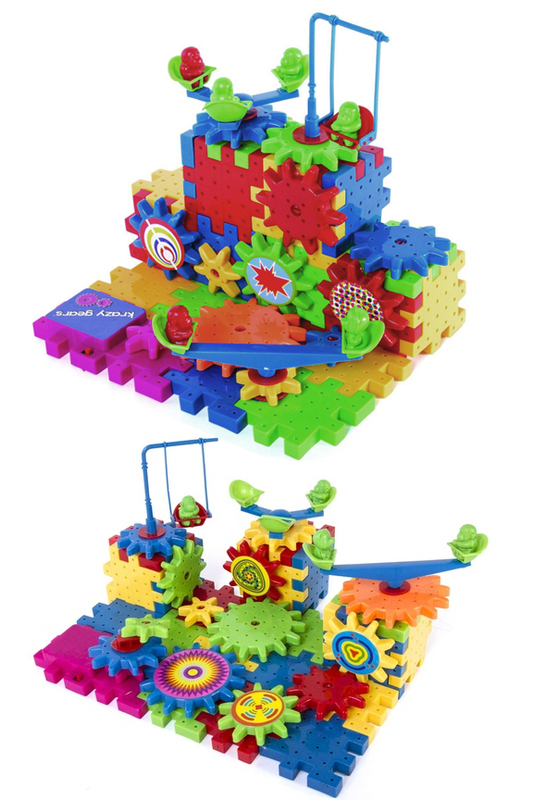 This set allows kids to build up or out, and with a multitude of holes on all surfaces, they'll be able to place gears vertically or horizontally. They can create a single tall tower, or they can make a colorful town by combining several small structures together. Once the spinning gears and playground equipment are added on top, they'll have a world full of motion to play with. This large set offers incredible options all on it's own, but combine several together to create truly amazing structures. Simple enough for children as young as three, but versatile enough for kids of all ages, and parents alike. The fun pieces and endless possibilities make this set fun for almost anyone. Inserts connectors onto the interlocking blocks by inserting into the holes in the surface. Place gears onto connectors by aligning the center hole with the post on the connector. Add a connector to the tops of gears to add playground equipment and accessories. To ensure proper movement once turned on, make sure all gear edges are touching. Place the motorized gear block at the end. To spin gears without the motor, use the manual crank by adding it to the top of a gear. Use the on/off switch to operate the motor, then watch your creation come to life. Box Dimensions 14" x 9" x 2.5"
Uses An educational building toy for kids of all ages. Endless possibilities result in hours of fun. Design your own playground, then turn on the motor to watch the gears spin as the characters play and move. A motorized building set for kids. 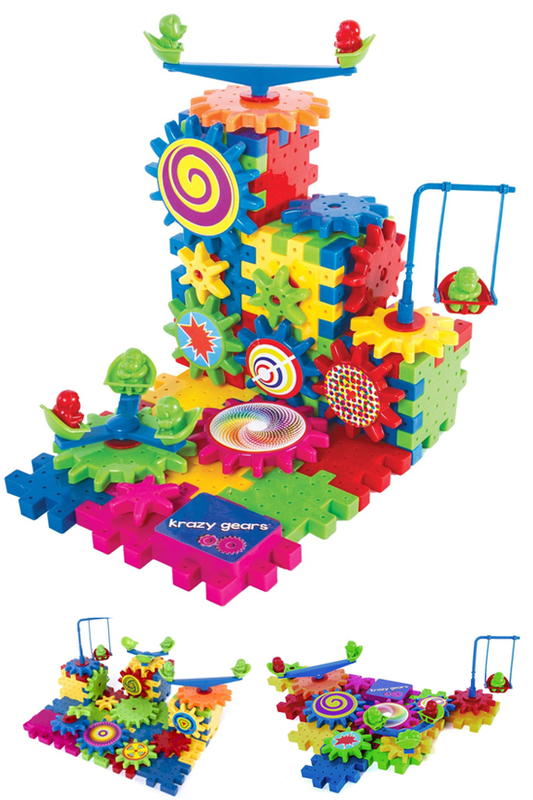 This playground edition features several characters and play equipment for a wide variety of construction possibilities. Complete with motor to make the gears spin, this set offers endless amounts of fun. Kids will explore and create as they develop motor skills, coordination and problem solving skills. Order Yours Today! We combined two building sets. My son and his children were entertained configuring the moving playgrounds on Christmas day.